AEVI has entered into a partnership with TruRating, a leading provider of a point-of-sale rating system to offer their customer feedback solution via AEVI’s Global Marketplace to Merchants Banks & Merchant Acquirers. Building on AEVI‘s recent partnership announcements with Kounta and VSI, AEVI is pleased to welcome TruRating to the Global Marketplace, a collection of business-standard, high-quality value-added apps and services delivered to clients through a white-labelled marketplace in a secure environment. This is designed to revolutionise how merchants conduct and streamline their businesses by providing a new way of engaging with customers. By providing TruRating, AEVI’s Customers can now enable their merchants to receive faster and smarter customer feedback at the point-of-payment. Ratings without rantings. TruRating helps businesses gather regular, accurate insight through simple and anonymous customer feedback at the point of payment. 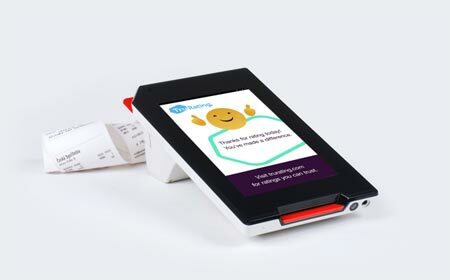 Once activated, one of five simple questions appears on the terminal screen during each payment process and consumers can anonymously rate an aspect of their experience. This allows data to be gathered and fed into an easy-to-use analytics dashboard accessible online or via the TruRating app. TruRating averages an 88% response rate, which means that merchants get to hear from the majority, not just the overly negative or suspiciously positive ones. It’s easy for merchants to set up, and even easier for their customers to use. With the TruRating solution joining AEVI’s Global Marketplace, merchants in the retail, hospitality & travel, services, health & lifestyle and food & beverage industries will be able to track customer ratings easily, and quickly respond to customer concerns. “We are delighted to welcome TruRating as a partner for our Global Marketplace,” says Mike Camerling, Chief Product Officer & Board Member at AEVI. “TruRating’s application enables our customers, merchant banks and acquirers, to provide their merchants with a service that will give voice to their customers through the point-of-sale. With this application, merchants will be able to better understand their customers’ needs and make better informed decisions, hence increasing choice and flexibility”. TruRating will join AEVI on their booth at Money 20/20 Las Vegas, the world’s largest payments and financial services innovation event on October 23-26, 2016. At the event AEVI will present its open ecosystem, Global Marketplace and connected devices, together with many App Partners at Booth 1221. Moreover, AEVI is going to announce a third-party vendor cooperation during the Track Session on Monday October 24, 2016 at 11:40 – 11:50am. At Money 20/20, AEVI and partners will be inviting US banks, acquirers, ISOs and hardware vendors to join them in their battle to bridge the gap in the market and develop the first truly open ecosystem.